If there were a prize given to the person who had done the most to elevate William Shakespeare’s reputation, David Garrick would be a top contender. The actor-manager was responsible for organizing the Shakespeare Jubilee of 1769 in Stratford-upon-Avon, which is the subject of a new book by Andrew McConnell Stott. Stott, professor of English at the University of Southern California, examines the impetus for and planning behind event, its great successes and failures, and the big boost it gave to Shakespeare’s place in the national history and the public imagination. Among the festivities planned for the Jubilee: A pageant of Shakespearean characters who would parade through the town. 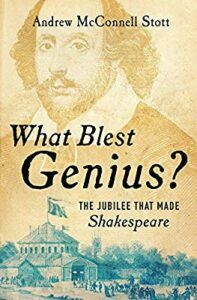 Learn more in the excerpt below from What Blest Genius? The Jubilee that Made Shakespeare. As the sun began to set, bonfires were lit and Domenico Angelo and the sulfurous Clitherow set to work illuminating the transparencies that had been placed in the windows of the birthplace and of Town Hall. These transparencies were paintings on gauzy canvas whose large frames covered the windows; when lit from behind, they shone through with brilliant colors. Hanging over the window in which Garrick had decided that Shakespeare had been born was a painted device showing the sun struggling through the clouds “in which was figuratively delineated the low Circumstances of Shakespeare, from which his Strength of Genius rais’d him, to become Glory of his Country!” The illuminations covering the five front windows of the Town Hall were even more ambitious. In the center was a full- length figure of Shakespeare capturing a Pegasus in flight above the inscription “Oh! For a muse of fire.” To his left were Falstaff and Pistol from The Merry Wives of Windsor, while to his right was Lear in the act of execrating his daughters, and Caliban drinking from Trinculo’s keg from The Tempest. A hundred colored lamps shone through these canvases, which Garrick had modeled on ones created by the Royal Academy to illuminate its buildings two months earlier in honor of the king’s birthday. Those transparencies, representing painting, sculpture, and architecture, were by the artists Giovanni Cipriani, Benjamin West, and Nathaniel Dance, respectively. Garrick admired the effect and, hoping to save money, asked his friend Sir Joshua Reynolds, the first president of the recently founded academy, whether he could borrow them. Reynolds insisted he “could not part with them,” so Garrick turned to the scene makers French and Porter to build some of their own. As they were being built, it dawned on him how usefully these might be used onstage to effect instantaneous scene changes, in which the image seen by the audience would miraculously transform depending on whether the gauze was lit from the back or the front, an effect that would come to be used often at Drury Lane. it is inconceivable to think how many well- meaning people of the place were in a continual alarm for the safety of the town, which they actually imagined would undergo some signal mark of the Divine displeasure, for being the scene of so very prance a festival. In this opinion they were doubly confirmed . . .  when the Town was illuminated for the Assembly, and some transparencies hung out at the window, for the amusement of the populace. . . . These devices struck a deep apprehension on the minds of the ignorantly religious; they looked upon them as peculiarly entitled to the vengeance of Providence, and wished the Londoners heartily at home, though they found our money so highly worth their acceptance. The first event planned for the day was a pageant of Shakespearean characters that was to process through the town from George Garrick’s base at the College before filing into the Rotunda, where they would line up in anticipation of the Dedication Ode. One hundred and seventy actors and local volunteers assembled to dress as directed, milling about in costume as their voices bounced off the high ceilings or they ran outside to shoo the children away from the puddles. Among them was the young Henry Angelo, representing the spirit Ariel, and Francis Wheler, the lawyer who had presented Garrick with the mulberry box, excited to be a part of the procession despite suffering an attack of hemorrhoids that had almost prevented him from reaching Stratford at all. George called everyone outside and hurried about marshaling the group, placing them in the order his brother had ordained. At their head was a large triumphal car carrying actors representing the muses of Comedy and Tragedy— in essence, a cart that had been clad in pasteboard and decorated to befit the occasion, pulled along by six hairy- legged satyrs. Dancers dressed as the remaining seven muses and women playing tambourines and representing the three Graces were to skip alongside. Only nineteen of Shakespeare’s thirty- seven plays were included, those plays most commonly performed in Garrick’s theatre, with As You Like It taking the front and Antony and Cleopatra bringing up the rear. 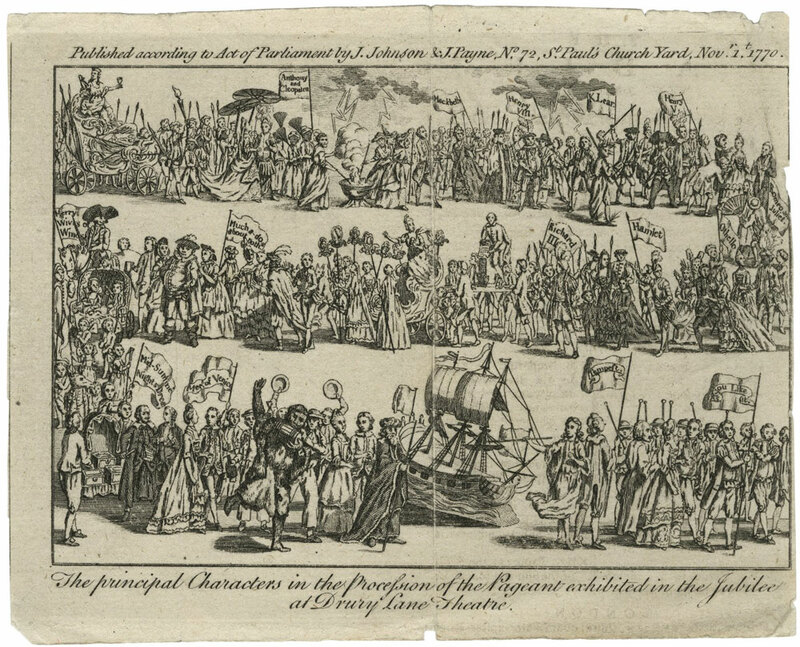 Each play was represented by a group of four or five processioners who bore a banner before them while performing in dumb show a scene that presented, in Garrick’s words, “some capital part of it in Action.” The result was a line of people who together formed the most memorable highlights of Shakespeare’s canon as understood by eighteenth- century audiences— Lear in the throes of madness, Macbeth holding a bloody dagger, Malvolio waving a forged love note, and Fluellen forcing Pistol to eat a leek. As always, getting organized took time, and the props and costumes, creations of wire and tinsel that looked fabulous under Drury Lane candlelight, began to blister and crease in Stratford’s squalling rain. This horrified Garrick’s business partner James Lacy, who went immediately over to Garrick’s rooms to call the procession to a halt. This excerpt from What Blest Genius? The Jubilee that Made Shakespeare by Andrew McConnell Stott was used with permission from W. W. Norton. I am currently writing a book about the Private theatre at Wynnstay (for which you have many playbills) which was partially at least, inspired by the Sahakespeare Celebrations organised by David Garrick. Sir Watkin Williams Wynne was a friend of David Garrick and visited the Festival (which was a great success despite the rain) Sir Watkin was inspired to creat his own Private theatre at his homr of Wynnstay Hall in Denbighshire. If you would like it, I could write an article about this to acccompany your article. I am actually creating the book using FrameMaker, but could use Word. Either way, I could save it as a .PDF. The illustrations are an integral part of the files. As you have many copies of the playbills, it would be good if I could use a scan of one of yours. You sent me a list a while ago, and I have scans of those held at the National Library of Wales, but would have to get permission to use these. mea culpa, I have noted two typos, I apologise.